If I were Lebron, I would not want to follow in Tiger's footsteps at all. I think the whole idea of star's being a role model is ludicrous. Why should their fame encourage us to buy one product over another? I know, market researchers have proved that it works, but I HATE IT! The whole idea of endorsements and the millions of dollars they pay has gotten out of hand. Kass, I think it's safe to say that the older and more experienced one becomes, the less such endorsements matter. But they're still influential with the young, and of course that's why advertisers put such stock in it, and also why they're largely uninterested in advertising to mature audiences, whom they assume have already formed their brand loyalties and thus ignore most advertising. 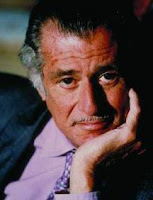 I love Frank Deford. Always have, including those heady days back in middle school and high school when I would devour every word the guy wrote for SI so I would be prepared to take my rightful place as the Indians beat writer for the Plain Dealer someday. The economics of having five kids and trying to get by on a sports writer's salary squashed that dream -- not to mention Paul Hoynes' longevity in the position -- but I never lost my admiration for Mr. Deford's work. Thanks for posting the link, John. Scott, how splendid to have you back for a visit. I've missed seeing your name here, and hope your new year is getting off to a fabulous start. And by the way, as you may have already gathered, I quite agree with you on Deford. He's sui generis. Sigh. Would it be too much to wish that neither Tiger nor LeBron nor Lance be the top athlete for Nike and we might get, oh, Emma Snowsill the triathlete or Dara Torres the swimmer? Suggestion noted. But practically speaking, I wouldn't expect this to happen, or at least not until we see women's NCAA games being better attended than men's. Can't say I expect that any time soon. Funny you should mention him. I was thinking lately how nice it was that he had been mostly missing from the tube, because I find him quite obnoxious. And sure enough, there he was yesterday, actually embedded into one of the NFL playoff game broadcasts at halftime. And do you mean he's an example inclusivity because of his dweebiness, the fact that he's a former fat guy, or something else? May you should know that Jared got engaged as did Colt McCoy. I didn't know that about either. You seem to be paying more attention to both sports and pop culture than me. I can't imagine putting up with that guy Jared and his boreathons. Then again, maybe he's a more interesting guy in real life than he seems to be on those idiotic commercials. It's a new year, so I'll give him the benefit of the doubt. Love the wording "unfashionable land of his nativity," even though it makes me sad being a Cleveland-Akronite. Not only do I want Lebron to stay because of the championship possibilities and optimism he has brought to Cleveland sports fans finally (PLEASE LEBRON STAY) but I can't imagine his mansion going vacant! Think I'll go make some cookies and drop them off at his security gate? It is a great line, Kristine. You should know that Deford happens to live in Connecticut, which considers itself the center of the urbane universe. And no matter what Lebron decides with his career, I don't think that mansion of his is going anywhere. He'll always remain an Akron guy first, no matter where he plays. Do let me know how that cookie drop works out, though. Has ESPN moved? I didn't know that. It used to be in New Jersey. Amazing the things you learn from blogging.